A Meaningful Life, A Better World: Why Not Fish? I'm often asked why I don't argue that advocates should focus on fish, given that the numbers of fish killed every year is even higher than chickens. I am, of course, heartened when people are concerned about numbers, as opposed to only working on things that they personally find most compelling. 1. Some people focus entirely on numbers, and not the reality behind the numbers. But I don't care about numbers, I care about suffering. 2. 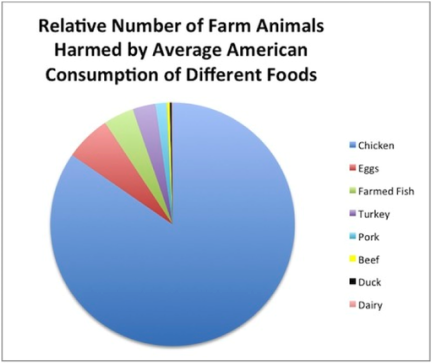 Many if not most "fish" that are killed (just based on numbers) aren't sentient / don't suffer (clams, oysters, shrimp). 3. Most vertebrate fish that are killed are wild fish who would have suffered greatly in their "natural" death if they hadn't been caught. A "natural" death of predation, disease, or starvation, may well be worse than a death by suffocation or decapitation. So catching a wild fish doesn't clearly increase the suffering in the world. 4. Only farmed vertebrate fish (e.g., catfish) might be adding suffering to the world by choices to eat them. 5. Our most likely audience for dietary change (youngish women) doesn't eat much fish. Ellen says she never saw her high school or college friends eating fish. Always chickens. The numbers and the suffering are only two of the three factors we must consider. Tractability is also key: will our advocacy actually have an impact? However, when advocates start saying things like "people eat 500 fish/ year," we greatly distract from where our efforts can actually have the biggest impact on actually reducing suffering. And, of course, every time we add on something else to our ask, we undermine the point of having a single, reasonable, sustainable impactful action. As always, my approach isn't based on what is "right" or "consistent" or "popular." I try to shape my advocacy such that it can have the biggest possible impact in the real world. Interesting points, thanks for posting this. I am one of those people that wrote something focusing purely on the numbers (http://considerveganism.com/blog/2015/09/07/which-dietary-changes-have-the-most-impact.html) and will likely update it to convey some of your points. To make this a stronger argument, you might want to temper points 2 and 3. As to 2, the case against oyster sentience has some weight from ethologists, but the same is not as clear for all clams and shrimp. As to 3, even if caught fish suffer no more than they would otherwise from predation/parasites, prematurely removing them from their ecological niche speeds their replacement when the population naturally rebounds, thereby increasing net suffering. Could you expand on your second point a bit? What would your scenario look like without any fishing? How would that lead to less net suffering? From what I can tell, you're saying that the rebounding that would occur would be due to decreased competition rather than an increased birth rate, right? If that's the case, then that means that the previous population equilibrium would have been caused by competitive pressures, which seems like it'd involve quite a bit of suffering (i.e. starving). I'm referring primarily to an increase in fecundity due to relative abundance of resources. Decreased competition also can't be ignored, however, since it can have a profound effect on hatch rate, leading to more sentient adults than would have come into existence without fishing. The post makes several interesting claims that I haven't seen sources for elsewhere, and would appreciate links or citations for. "Most "fish" that are killed (just based on numbers)"
Do you have a citation for the relative role of vertebrates and invertebrates in the reported numbers? "aren't sentient / don't suffer (clams, oysters, shrimp)." Usually people put shrimp in a different category than bivalves, do you have a link for your argument regarding their status? "would have suffered greatly in their "natural" death if they hadn't been caught"
Isn't it quite unlikely that this would be very similar between fishing and wild deaths? Death by suffocation when captured can take a while, longer than being eaten by predators, although less than starvation and disease. Then fishing would be either quite bad or quite good, but not nearly neutral. Do you have a model about the average wild death vs fishing death? Shrimp have an even simpler nervous system. However, the question of having ethically-relevant experiences (truly being able to suffer, not just sense) is a much more complicated question. Being actually aware, and not just an organic robot, requires significant complexity in the brain. As a primer on that, I'd suggest Antonio Damasio's "The Feeling of What Happens." http://amzn.to/29LrUMB If you email me, I can supply some of the relevant excerpts. In short, we are far to quick to attribute "consciousness" to things that seem to exhibit intentional behavior. The questions surrounding the manner of death are important, and Lewis brought those up with me separately. I don't know what I would prefer -- to die from being "fished," or to take my chances with a "wild" death. More importantly, though, is that modern chickens are in chronic pain for much of their lives. As Veterinary Professor John Webster notes, modern chicken production is "the single most severe, systematic example of man's inhumanity to another sentient animal." I would certainly rather be a fish (even if fish are truly sentient) many times over, rather than a bird. Regarding # of neurons, how steeply do your attributions of sentience/importance scale with # of neurons? E.g. the difference in # of neurons between humans and chickens is on the order of 400x. The difference between chickens and lobsters (using the lobster figure from that page, and Herculano-Houzel's results for chickens and humans) is ~2000x. How do each of those gaps affect your prioritization? Carl, I take neurons to be an approximate measure of a creature's place on the "sentience" scale. Somewhere along the line, a creature with a nervous system can't suffer at all (going down), but also I think sentience fades. I'm interested in seeing your data behind #2, as I have seen the opposite (over 84% of this catch is finfish) in the US (not sure about the rest of the world.) Please send to kellylevenda@gmail.com. Thanks! See the links in the message for Carl (above). See the discussion and links above (in the discussion with Carl).